Since my dissertation on the book of Jeremiah, I’ve been engaged with the question of whether we can better understand the Hebrew Scriptures by reading them as philosophical texts. Many people assume that the biblical texts are “revelation,” and that they are supposed to be read mostly for what they have to tell us about miracles or the afterlife. But the Hebrew Bible doesn’t seem to be about these things. I see the biblical works as being much more similar to other works of reason composed in antiquity, which were written to advance views on ethics and political philosophy, metaphysics and theory of knowledge. In 2009, I organized the first of series of annual conferences at Shalem in Jerusalem for scholars of philosophy, political theory, Bible and other disciplines who are interested in exploring the philosophy of the biblical authors. A year later, I was awarded a grant by the John Templeton Foundation to conduct an international research initiative on the philosophical investigation of the Hebrew Bible, Talmud and Midrash. This is called the Jewish Philosophical Theology project, of which I’m the Director. This initiative includes fellowships for scholars for wishing to work in this field, as well as workshops for graduate students and for rabbinic students. My book The Philosophy of Hebrew Scripture (Cambridge, 2012) is an introduction to this subject. 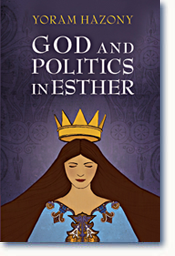 A follow-up volume is God and Politics in Esther (Cambridge, 2016). 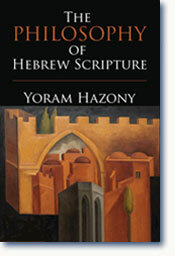 A volume on the God of the Hebrew Scripture is in the works. You can stay current with developments in the area of philosophy of the Hebrew Bible, Talmud and Midrash by subscribing to the Bible-Philos listserv. Yoram Hazony and Dru Johnson, eds., The Question of God’s Perfection: Jewish and Christian Essays on the God of the Bible and Talmud (Leiden: Brill, 2019). The Philosophy of Hebrew Scripture (Cambridge: Cambridge University Press, 2012). 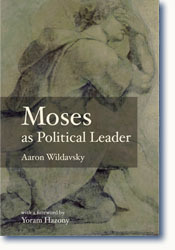 Aaron Wildavsky, Moses as Political Leader, Yoram Hazony, edited with introduction (Jerusalem: Shalem Press, 2005). “Is God ‘Perfect Being’?” in Yoram Hazony and Dru Johnson, eds., The Question of God’s Perfection: Jewish and Christian Essays on the God of the Bible and Talmud (Leiden: Brill, 2019), pp. 9-26. “The Bible and Leo Strauss,” Perspectives on Political Science 45 (Summer 2016), pp. 190-207. “Three Replies: On Revelation, Natural Law, and Autonomy in Jewish Theology,” Journal of Analytic Theology 3 (2015), pp. 172-205. “The Political Thought of the Biblical Narrative, Genesis-Kings,” Jonathan Jacobs, ed., Judaic Sources and Western Thought, (Oxford: Oxford University Press, 2011). The Christian Alternative Resurrected: Why Can’t Jews Do That? Response to Jon Levenson: Is There a Philosophy of Hebrew Scripture?